Did you know there are some great publications out there that are almost always free? Some of my favorite magazines are completely free! As a reminder, we ONLY call something free if it does NOT require a credit card number. We will never call something free if it requires a credit card, because as busy moms-- as the mamabreak mamas are-- we often forget to "cancel" and end up paying for that freebie! These magazines do not require a credit card, and will not extend on their own and charge you AFTER your subscription ends. They are completely, 100%, free. 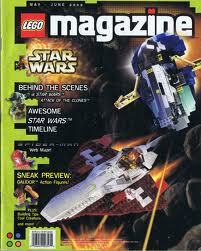 Lego Magazine: If you have a kids who love Legos, you NEED to get this magazine! We adore the Lego magazine, and although it comes for my 6 year old son, my 9 year old daughter loves it too! American Baby Magazine: 1 year of American Baby Magazine! This is a great publication if you are pregnant or having a baby. The link is long (sorry, it was the only way I could find to get it free), but clicking above or here should get you to the right place. Baby Talk Magazine: Another great one if you have a baby or are pregnant! Completely free for 1 year! Grrr Magazine From PETA: My kids love this magazine which focuses on animals. It has wonderful pictures and great information. It also includes free stickers. We realize that it is a political type of magazine, and it does support animal rights, but we wanted to share it, as it is a magazine our family loves. Next week: We are sharing "coupon" websites! just went & ordered the Lego & Peta Magz for my girls! the other ones, im allready getting for free too! thanks for the scoop on the new ones! I love free magazines! Thank you for sharing. Great magazines! Isn't it better when they are free? !